The aim of the Apollo programme was to land the first person on the Moon. However, when the program was announced, in 1961, only two people had actually been in space. Scientists were faced with a daunting task - to construct a rocket powerful enough to reach the Moon and a spacecraft that could travel there and back. Built for the Apollo missions, the giant Saturn V rocket was one of the most powerful rockets ever built. It was extremely successful, with 13 perfect launches and no failures, even during its test flights. 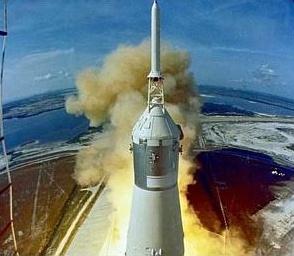 Saturn V carried the Apollo craft into Earth orbit; then the third and final stage fired again to provide an extra boost to place it on the correct trajectory for the Moon. Three main components made up the Apollo spacecraft. The command module (CM) held supplies and contained the crew's quarters, which had just enough room for the astronauts to move around in. Attached to the CM was the service module (SM), which housed the craft's main engine. It supplied electrical power and controlled the crew's life suppport system. On returning to Earth, the SM was jettisoned, the CM, with the astronauts inside returned to Earth. The third part of the craft was the lunar module. The Apollo Lunar Module (LM) carried the astronauts onto the Moon's surface and was home to them during their stay. There were no seats and there was only just enough room for two astronauts to stand. Once on the Moon, the astronauts could leave the LM to explore the surface. On January 27, 1967, the launch crew and flight crew of the first manned Apollo mission were conducting a simulated countdown to test the operations and compatibility of the CSM and the launch vehicle prior to their scheduled launch the following month. The spacecraft was ready for a simulated launch, with hatch locked, power on, and an internal atmosphere of pure oxygen. The crew of Virgil I. Grissom, Edward H. White II, and Roger B. Chaffee were in their space suits and performing the normal sequence of prelaunch activities. At about 6:30pm, after over five hours of delays and problems, a spark inside the spacecraft ignited flammable material and instantly engulfed the closed compartment in flames. By the time the hatch was pried away more than five minutes later, the crew had died from asphyxiation. The precise source of the spark and fire was never determined; neither were any individuals or specific organizations implicated in the fire. In retrospect, the actual cause was due to the combination of several conditions: an oxygen-rich atmosphere; flammable interior materials such as paper, the space suits, velcro, and other flight equipment; a vast array of exposed internal wiring, which presented many potential sources of electrical sparks; and the design and manufacture of the spacecraft. As a result of the fire, many changes were made to the design, manufacturing, test, and checkout procedures of the vehicles and the management of the entire Apollo Program. Many of these changes were tested in the unpiloted Apollo missions 4, 5, and 6. The vast improvements to the CSM, in particular, and the process by which it was prepared for flight, proved highly successful. The CSM performed almost flawlessly during the remainder of the Apollo Program (with the exception of Apollo 13). Apollo 7 was the first manned earth orbit flight test of the CSM. This ten-day mission was launched on October 11, 1968. On board were Walter M. Shirra, Donn F. Eisle, and R. Walter Cunningham. While orbiting the earth, the crew practiced maneuvers that would be used in a lunar mission. After exiting orbit and re-entering the atmosphere, the capsule and crew were safely recovered in the Atlantic Ocean. Apollo 8 was launched on December 21, 1968, and was the first manned mission to achieve lunar orbit. The crew of this six-day mission, Frank Borman, James A. Lovell, Jr., and William A. Anders, conducted a complete test of the CSM flight profile for lunar missions. The CSM entered lunar orbit on December 24, 1968, and orbited the moon for ten revolutions (20 hours 7 minutes) before returning to the earth and a controlled reentry into the Pacific Ocean. Apollo 9 was the first flight test of the complete lunar landing mission including the CSM, the LM, and the EMU. The crew consisted of James A. McDivitt, David Randolph Scott, and Russell L. Schweickart. The first Apollo spacecraft to be named, Gumdrop (CSM) and Spider (LM) were launched into the earth's orbit on March 3, 1969. During ten days of operations, the crew demonstrated all Apollo mission maneuvers. Remaining in the earth's orbit, the crew simulated a lunar landing with the LM and conducted the first actual LM rendezvous with the CSM. The astronauts conducted a 56-minute EVA to demonstrate EVA crew transfer from the LM to the CSM. The crew also practiced backup safety maneuvers, including a procedure in which astronauts used the LM as a lifeboat in case the command module was rendered inoperable or uninhabitable. This procedure was subsequently used to recover Apollo 13. Apollo 10 was a dress rehearsal for a lunar landing mission and was conducted in lunar orbit, but it excluded the actual landing. Launched on May 18, 1969, the spacecraft Charlie Brown (CSM) and Snoopy (LM) spent over two days and 31 revolutions in lunar orbit. The crew of Thomas P. Stafford, John W. Young, and Eugene Andrew Cernan conducted all propulsive maneuvers required for a lunar landing mission. During lunar orbit, Stafford and Cernan descended in the LM to within 14 km (18 mi) of the lunar surface before completing the first lunar orbit rendezvous with the CSM. This eight-day mission was recovered in the Pacific Ocean and was completed less than two months prior to the planned launch of the first lunar landing mission. 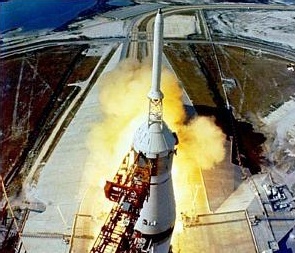 Apollo 11 - "One small step for man..."
Apollo 11 was the first lunar-landing mission. Launched on July 16, 1969, the crew of Neil A. Armstrong, Edwin E. Aldrin, Jr., and Michael Collins flew the spacecraft Columbia (CSM) and Eagle (LM). On July 20, 1969, Armstrong and Aldrin landed the Eagle at the relatively flat and unobstructed Tranquillity site on the moon, while Collins remained in the CSM. The LM spent 21 hours 36 minutes on the lunar surface, and the crew spent 2 hours 31 minutes outside the LM in a local area excursion on foot to a distance of approximately 50 m (160 ft) from Tranquillity Base. Armstrong and Aldrin evaluated the capability of working on the lunar surface, established a small scientific station, and collected 21 kg (46 lb) of lunar rocks and soil. Using the descent stage of the LM as a launching platform, the ascent stage of the LM took off from the moon's surface to rendezvous and dock with the CSM. The spacecraft departed lunar orbit over two days after arrival. This eight-day mission landed and was recovered safely in the Pacific Ocean. As a precautionary measure, the astronauts were quarantined for 14 days. Apollo 12 was the second lunar landing mission and the first mission to make a pinpoint landing on the moon. Launched on November 14, 1969, the crew of Pete Conrad, Richard Francis Gordon, Jr., and Alan LaVern Bean flew the spacecraft Yankee Clipper (CSM) and Intrepid (LM). Conrad and Bean landed the LM on the southeastern Oceanus Procellarum region of the moon within 200 m (660 ft) of their target. The crew spent 31 hours 31 minutes on the lunar surface conducting two excursions for a total of 7 hours 45 minutes. They traversed 2.0 km (1.2 mi) on foot and ranged up to 470 m (1500 ft) from their base, the Intrepid craft. The first excursion included an inspection of the Surveyor 3 lunar probe, which had landed on the lunar surface years earlier. Several components were extracted from the probe for engineering analysis. During their stay, Conrad and Bean set into place an ALSEP scientific station, conducted geological observations, and collected 34 kg (75 lb) of lunar rocks and soil. After LM ascent, rendezvous, and docking with the CSM, the CSM departed lunar orbit just under four days after arrival. This ten-day mission landed without incident in the Pacific Ocean. Apollo 13 was launched on April 11, 1970, as the third planned lunar landing mission. The crew of James A. Lovell, Jr., John L. Swigert, Jr., and Fred Wallace Haise, Jr., flew the spacecraft Odyssey (CSM) and Aquarius (LM). Two days after launch, as Apollo 13 approached the moon to begin lunar operations, an explosion occurred that caused the service module of the CSM to lose its oxygen, electrical power, and other systems, including its capability to perform an abort maneuver for a direct return to the earth. The crew quickly moved to the LM which became their lifeboat in space. All of the systems in the command module of the CSM, which remained functional, were deactivated to preserve its capability to reenter the atmosphere upon return to the earth. The LM had no heatshield and therefore could not be used for earth reentry. At the time of the explosion, the return time to the earth was over four days. Because the LM did not have enough oxygen or water for this length of time, it became necessary to use the LM lunar landing engine for a major propulsive maneuver in space to change the spacecraft's path and speed its return to the earth. Overcoming numerous life-threatening problems, including near freezing temperatures and excess carbon dioxide in the LM, Apollo 13 successfully reentered the earth's atmosphere for a landing in the Pacific Ocean on April 17, 1970, over five days after launch. The cause of the explosion was traced to a chain of events resulting in the ignition of the insulation covering a wire inside one of the three liquid oxygen tanks in the CSM. It occurred when a fan (to which the wire was connected) was turned on to stir the liquid oxygen inside the tank. Apollo 14, the third mission to land on the moon, was launched on January 31, 1971. The crew of Alan B. Shepard, Jr., Stuart A. Roosa, and Edgar D. Mitchell piloted the spacecraft Kitty Hawk (CSM) and the Antares (LM) to a landing in a hilly region just north of the Fra Mauro Center. Using the Mobile Equipment Transporter, a two-wheeled cart, Shepard and Mitchell traversed 3.3 km (2.1 mi) on foot and reached a distance of approximately 1400 m (4600 ft) from the LM. During two surface excursions, they set into place an ALSEP scientific station, conducted geological observations, and collected 43 kg (96 lb) of lunar rocks and soil. After LM ascent, rendezvous, and docking, the CSM departed lunar orbit nearly 3 days after arrival. This nine-day mission landed safely in the Pacific Ocean. After this mission, scientists at NASA decided that a full quarantine of returning astronauts was no longer necessary. Apollo 15 was the first of three extended scientific explorations of the moon using the LRV, the extended-duration PLSS, more mobile space suits, and more highly trained crews. These last three missions established the first lunar bases on the moon. Launched on July 26, 1971, the crew of David Randolph Scott, Alfred M. Worden, and James A. Irwin flew the spacecraft Endeavor (CSM) and Falcon (LM). On July 30, 1971 Scott and Irwin landed the LM on the western edge of the Apennine mountains, and, during the nearly three days they spent on the moon, the crew conducted four explorations outside their home base, called Hadley Base. They traveled a total distance of 27.9 km (17.3 mi) on the LRV, ranging up to 4.9 km (3.0 mi) from the LM, and moving over the horizon and out of view of their home base for the first time. They set into place an ALSEP scientific station, made extensive geological observations and interpretations, and collected a total of 77 kg (170 lb) of lunar rocks and soil. This 12-day mission landed safely in the Pacific Ocean. Apollo 16 was launched on April 16, 1972. The crew of John W. Young, T. Kenneth Mattingly, and Charles Moss Duke, Jr., flew the spacecraft Casper (CSM) and Orion (LM). On April 20, 1972, Young and Duke landed the LM near Descartes Crater and during the nearly three days they spent on the moon, the crew collected a total of 94 kg (207 lb) of lunar rocks and soil. They traveled a total distance of 27 km (17 mi) on the LRV, ranging up to 4.5 km (2.8 mi) from Descartes Base. This 11-day mission landed and was recovered in the Pacific Ocean on April 27, 1972. Apollo 17 was the third extended scientific exploration of the moon and the final mission of the formal Apollo Program. Launched on December 7, 1972, the crew of Eugene Andrew Cernan, Ronald Elwin Evans, and Harrison Hagan Schmitt flew the spacecraft America (CSM) and Challenger (LM). On December 11, 1972, Cernan and Schmitt landed the LM in the Taurus Littrow Valley region of the moon. During the more than three days they spent on the moon, the crew traveled a total distance of 35.0 km (22 mi) on the LRV, ranging up to 7.8 km (4.8 mi) from Taurus Base. They collected a total of 110 kg (240 lb) of lunar rocks and soil. This 12-day mission landed in the Pacific Ocean. The Apollo Program demonstrated effective human geological exploration in the hostile environment of another planet. During the initial Apollo 11 lunar landing mission, the crew remained on the moon for less than one day and conducted a single excursion of less than three hours, during which they ventured only 50 m (160 ft) from the LM. By the sixth and final lunar exploration mission, the distance traveled on the lunar surface had greatly increased. By the last mission to the moon, Apollo crews had traversed a total distance of more than 97 km (60 mi) on the lunar surface and spent over 160 man-hours outside the LM. A broad range of over 60 scientific experiments were performed on the lunar surface, and 30 experiments were conducted from lunar orbit. Six long-term scientific stations were manually placed and activated on the moon by the astronauts. The last four operating stations (set up by Apollos 12 and 15 through 17) were finally turned off by NASA in 1977. The experiments carried out on the Apollo missions provided important information about the moon as well as the solar system. A total of 381.7 kg (841 lb) of lunar material was returned from six unique and scientifically significant lunar locations. Additionally, almost 30,000 high-resolution photographs were taken on the surface and from orbit during Apollo missions, recording the characteristics and features of the moon in great detail.